"Grace Crass, of Wernersville, [Pennsylvania,] claims that she was at the [game] with her church group when the massive, green, bird-anteater hybrid climbed through the stands and onto her legs," said the report on June 30 about the latest tort allegedly committed by the Phillie Phanatic. A study published in the Cardozo Law Review a few years ago claimed that the Phanatic held the "dubious record" of being the "most-sued mascot in the majors." A Phillies spokeswoman disputed that claim, but whatever the previous total was, it has now increased by one. Crass's attorney, John Speicher, said that the phanatical assault "set off the arthritic process" in his client, and that she ultimately needed knee replacements. 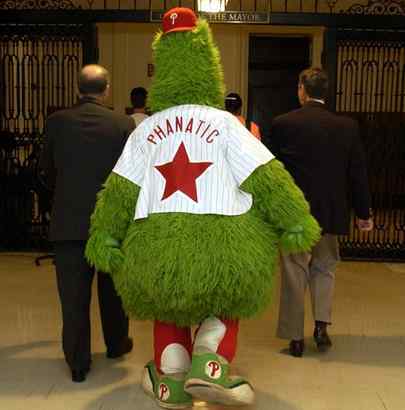 The lawsuit seeks damages from the Phanatic, the Phillies and the team's minor-league club, the Reading Phillies. (The injury took place at one of the minor-league games.) Speicher admitted that going after the Phanatic was not popular with everyone, saying that some had compared it to "suing Santa Claus." Bob Jarvis, a sports-law professor who wrote the 2002 law review article that pointed the phinger at the Phanatic, theorized that the Phanatic may be the "most-sued" partly just because he has been around so long, and because in a litigious society, "once you get sued once, your chances of getting sued again go up." He also noted, though, that the Phanatic has an especially "ungainly" body, which may contribute to the accident rate. And, of course, the massive, green, bird-anteater hybrid is a "Phanatic" and so may feel obligated to behave as such. "It's in his name," Jarvis said. "He has to walk around and do crazy things. . . . He's been around so long, he has to keep topping himself." Speicher also noted that suing the Phanatic might pose certain difficulties, especially in terms of the discovery process. "I'm expecting him to come to a deposition, stick his stomach and his tongue out at me and not say anything," Speicher said. That's usually what I advise my clients to do anyway, so that wouldn't surprise me, either.